How is process gravity different from Newton and Einstein theories of gravity? Newton and Einstein assumed that matter does not intrinsically change with age. Their gravity does vast amounts of work without affecting the matter that did the work. Process gravity is based on a different principle, that matter changes relationally with age. Process gravity theory accepts the visible evidence that matter changes relationally as orbits gradually spiral outward in the visible history of how billions of galaxies formed. No aspect of relationally changing things is unaffected by the changes since they happen in parallel, not just sequentially as in scientific causality. We can study physics two ways. If we study physicalness, we can propose particles (e.g. electrons and protons). Studying interconnectedness results in the strange world of the quantum (non-locality and wavelike properties). When the experimenter mixes tests expecting particles with tests expecting interconnections – the results suggest contradictory realities. This duality arises because matter is a relation with light (Genesis 1:1 – 3). Spacecraft make precision landings on Mars using Newton’s gravity. What use is process gravity? Process gravity is not mathematical so it cannot be used for planet landings. It merely allows one to accept visible, cosmic history. Scientists are trained to think with a historical assumption: that the essence of substance is changeless. This assumption was invented by medieval scholastics about 700 years ago. Scientists are trained to use operational definitions, measuring units and mathematical methods based on the notion that atoms do not change their dithering frequencies as they age. Scientists have invented a universe that is 99% invisible, crammed full of undetectable things, because western science was built on this assumption. For example, they surround every galaxy with four times as much invisible matter as the natural kind to force their laws of gravity on billions of uncooperative galaxies. We confirm the rudiments of process gravity optically without depending on a single mathematical formula or operational definition. An operational definition uses a procedure as a definition, usually without questioning whether the thing defined actually exists. The primary scientific measuring unit is the time second, defined operationally with atomic clocks. Scientists assume that atoms dither with perpetual motion, then use this assumption to define linear seconds and thousands of derivative measuring units. Yet we can directly compare the clocks from the past with local, modern ones. No light clock, shining from billions of ancient galaxies, pulses with the frequencies of modern atoms and the differences increase with distance (the past). The visible history of galaxies does not support the scientific laws of gravity, but process gravity cannot be made scientific because it is based on a different assumption than what science was founded on. When we compare the shapes of galaxies at many ranges, we see that the earliest ones were often naked, without starry arms. Billions of galaxies grew into huge, local, spread out, growth spirals as the stars continued to emerge and come out. The atomic clocks accelerated along with the outward accelerating, volumetrically increasing star streams. This is visible evidence for relational changes as matter ages. NASA found a galaxy in the Hubble Ultra Deep Field, UDFj-39546284, whose light shines at ~7.7% of the frequencies of modern, local atoms. This is a violation of the fundamental principle of science, so they claim space-time is stretching the light. No experiment ever detected light changing frequency as it travels through a void. How did matter become relational? According to the Hebrew of Genesis One, God first created (completed verb) the plural heavens (evidently the galaxies) and the Earth. The Earth at that stage was formless. The Earth’s matter, and by implication the galaxies, began to have extension as God continued to command light to continue to be. Indeed, light dithers around within all substances giving them their extension. Matter is a relation with light, not particles.We even observe great bursts of gamma light arriving from the early universe. Evidently this was God at work, commanding light to be, thus giving form to the unformed matter He created first. Wait! Physicists measure unchanging gravity? Gravity is undetectable, so you can only calculate its existence by observing how things change their motions. Generations of scientists invented thousands of measuring units for length, velocities, accelerations and the laws of gravity based on their concept of intrinsically unchanging matter and linear time. Yet clocks everywhere are accelerating relative to earlier clocks. When the spin stabilized Pioneer 10 and 11 exited the solar system, they reflected back to NASA the radio signals formed from local hydrogen maser clocks. The returned clock signals (when compared to NASA’s clocks of the moment), kept changing and the changes correlated with distance. The clock signals changed frequency at the Hubble ratio times thee speed of light. Astronomers use the Hubble ration to estimate the distance to ancient galaxies using their observed light clocks (colors). That is the kind of evidence expected from relational changes in all matter. What can Process gravity explain locally, on Earth? Huge dinosaurs could run and massive pterosaurs could fly because the effects of gravity were less in the past. We have tracks of running dinosaurs that, if they existed today, would have trouble standing. They would be much too heavy to run. Some giant pterosaurs were as tall as a giraffe, with legs as tall as a man. Their wing spans were as wide as those of jet fighter, ten meters, yet they could fly. We know they flew because we have tracks of one landing in mud that later petrified. Scientists estimate their weight (from body size. These are simple evidences that the gravitational effects were less in the early earth. That is ridiculous! Newton’s formula agree with Kepler’s orbital distances and periods. Kepler and Newton’s formulas presume that matter and its properties are not changing relationally. If they were, clocks and orbits would both change together. We verify that clocks and orbits accelerate together in visible, cosmic history. Galaxies could not have intrinsically grown from tiny naked globs to huge spread out growth spirals unless the properties of matter change relationally. Ancient people recorded how the planets passed close to earth, just a few thousand years ago. They recorded how a planet was shattered close to Earth, less than 5,000 years ago. The mentions the close passages and the planet shattering. They also recorded how the first generations lived for eons, when days and years were slower than they were for later generations (Genesis 47:9). They described the geological ages that passed during few days, back in the dinosaur age (Job 14). If we lived for geological ages, our brows would grow Neanderthal, just like their’s did. 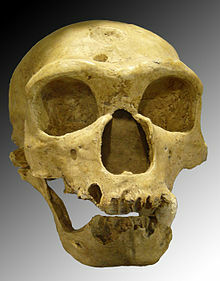 The picture of the La Chapelle Neanderthal skull is from wikipedia. Process gravity theory is based on a different elementary assumption. It assumes that matter is continually changing relationally. Whatever gravity may be, it is emitted from matter as its clock frequencies, its volume and its inertial properties all change together, relationally. The evidence for process gravity is visible cosmic history, not mathematical notions about atomic perpetual motion as in Newton and Einstein’s theories. 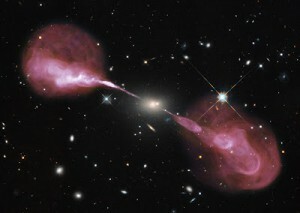 The top photo is a montage of a Hubble image (white) with a VLA radio telescope image (red) of the active galaxy Hercules A, also called 3C348. The galaxy is the tiny white smudge at the midpoint of the huge jets. The jets are made of outward moving, energetic gases that emit radio waves. According to scientists, the jets were ejected from a black hole. According to the Hebrew grammar of the Bible, God continues to finish the heavens and Earth. He continues to form the Sun, Moon and stars and continues to place them in the spreading place (Hebrew raqiya). We can follow at many ranges how the stars and gas emerged from the formless center of countless galaxies. The stars came out and spread out in unbroken continuity, just like described in the Bible. Photo credit: S. Baum and C. O’Dea (RIT), R. Perley and W. Cotton (NRAO/AUI/NSF), and the Hubble Heritage Team (STScI/ AURA/ ESA/ NASA).